Crave Interactive partners with Executive Hotels to expand its reach into Canada with the Installation of In-room tablets in the company's latest Vancouver hotel. At the new EXchange Hotel Vancouver, we are committed to providing a unique, interactive level of service. Our partnership with Crave helps us ensure that we’re elevating our offerings to meet the modern needs of our guests. Crave Interactive, the world leading developer of cloud-based digital guest service solutions for hotels, today announced it will install its award-winning Crave T-Mini tablets in the newly developed EXchange Hotel Vancouver. 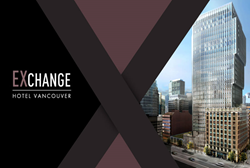 Opening summer 2018, the EXchange Hotel by Executive Hotels & Resorts is set in the heart of Vancouver’s Central Business District and will be a luxury 4-star boutique hotel occupying the first 11 floors of the 31 story Exchange Tower. The EXchange Hotel has chosen the award-winning Crave 8” T-mini tablet and charging dock to be installed in all of its 202 luxury rooms. The cutting-edge digital tablets will include powerful guest-facing features like digital food and special request ordering, guest messaging capabilities, built-in digital clock and infrared TV controls, as well as the company's world-class Crave OS; all powered by Crave Cloud. The addition of the EXchange Hotel marks the second installation for Crave in Canada at a time of growing demand for digital in-room tablets across North America. “At the new EXchange Hotel Vancouver, we are committed to providing a unique, interactive level of service. Our partnership with Crave helps us ensure that we’re elevating our offerings to meet the modern needs of our guests,” said Roland Monteiro, General Manager. Enjoy all of the Executive Hotels & Resorts locations including our two newest additions coming soon - The EXchange Hotel Vancouver (http://www.exhotelvancouver.com) and the Seaside Hotel, Spa and Provisions on the North Vancouver waterfront (http://seasidehotelvancouver.com/). Learn more about the Executive Hotel Le Soleil New York at http://www.lesoleilhotels.com/new-york/. Additionally, discover the Le Soleil Collection as well in Vancouver, BC, at the original Executive Hotel Le Soleil Vancouver, which is also a recipient of the prestigious AAA Four Diamond rating. Learn more about this stunning hotel at http://www.hotellesoleil.com/vancouver/. All Executive Hotels can be viewed and booked at http://www.executivehotels.net.